Kevin Harper got a little sleep last night after doing his chores and feeding his dogs. He woke up at approximately 1:00 a.m. to begin his preparations to depart Alpine Creek Lodge at 4:18 a.m. Jimmy Lanier was doing the same preparations for his departure at 4:10 a.m. Eight minutes will separate the two Junior mushers looking for a Junior Iditarod win. The rest of the teams are completing their chores in preparation to make their journey back towards Cantwell. The last musher to leave the lodge was Jordan Seager at 7:16 a.m.
John and I loaded up the sled hooked to the back of his snowmachine and began our 65 mile journey back to the finish. Another gorgeous trip back to Cantwell with views I cannot begin to describe. We passed the mushers one by one. I knew we must be getting close to the leaders because we were only about 5-10 miles away. We passed Andrew Nolan, so I assumed Jimmy and Kevin would be just ahead. The next thing I know, I see the finish line. At some point in the run Kevin made up those eight minutes and passed Jimmy. Kevin crossed the finish line at 9:46 a.m as the 2015 Junior Iditarod Champion. With Kevin not even out of the finishing chute, Jimmy came in at 9:48 a.m. Two minutes separated the Kevin and Jimmy in the race to the finish. Approximately a half an hour later Andrew Nolan rolled in with Iditarod veteran Wade Marrs looking as proud as ever. Wade has been training and helping out Andrew this season as well as another Junior musher, Marianna Mallory. Marianna came in sixth place. The Red Lantern winner, the musher that crosses the finish line last, was Joan Klejka from Bethel. Joan crossed the finish at 4:27 p.m. The awards banquet was held this evening at the school in Cantwell. A few of the awards given out at the banquet were the Sportsmanship award, the Humanitarian award, and the Blue Harness award. The Sportsmanship award was given to Andrew Nolan. What an honor for this young man. The Humanitarian award is given out by the veterinarians by the musher that displays the best care for their dogs. Marianna Mallory was awarded this honor. Marianna and Andrew’s trainer put it best, “to our kennel, that’s just as rewarding as winning.” That is such a true statement. It shows young athletes that sometimes there is more than winning. The Blue Harness award is voted on by the mushers themselves to the best lead dog. This award was given to Jimmy Lanier and his dog Alpha. Another award was handed out tonight. 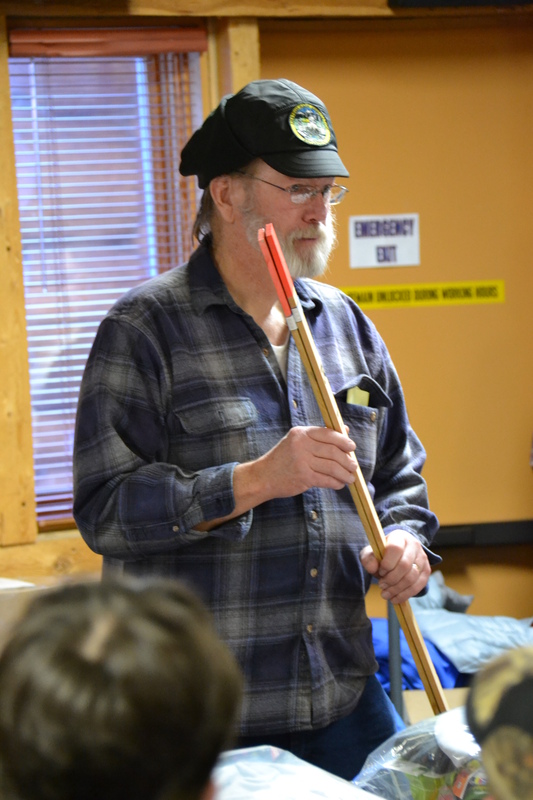 At the rookie meeting Thursday night, Danny Seavey challenged the young mushers to have consistent run times on the way out and the way back. Marianna took home this award as well. For this award she won a $50 Cabela’s gift card. I truly enjoyed being able to witness these young kids complete their journey of finishing the Junior Iditarod. They all displayed such respect and care for one another. It is more than a competition, it is a life long journey complete with many life lessons. These Junior mushers showed courage, responsibility, endurance, willpower, determination, and so much more over the course of their race and training. “Will it be a boy or a girl this year?” This is the question Barb Redington asked the junior mushers last night at the Junior Iditarod Mandatory Meeting. There are eleven juniors racing this year, six girls and five boys. Ten out of the eleven young mushers sat in the front row at Iditarod Headquarters listening to Barb introduce the many volunteers of the race and thank the gracious sponsors. After thanking the countless sponsors and volunteers it was time for the youngsters to draw the start order, their bib number. The juniors will draw in the order they signed up for the race. Bib number one is traditionally granted to the honorary musher. Longtime Junior Iditarod veterinarian, Dr. Jayne Hempstead, is the 2015 Junior Iditarod honorary musher. Below is the order the mushers will embark on the trail. Read their biographies at the Junior Iditarod website. Bib #3: Kevin Harper (Veteran) Junior in H.S. Bib #5: Andrew Nolan (Veteran) Sophomore in H.S. Bib #6: Katie Deits (Rookie) Sophomore in H.S. Bib #7: Nicole Forto (Veteran) Senior in H.S. Bib #8: Marianna Mallory (Rookie) Junior in H.S. Bib #9: Rose Capistrant (Rookie) Freshman in H.S. Bib #10: Joan Klejka (Rookie) Sophomore in H.S. Bib #11: Jannelle Trowbridge (Veteran) Senior in H.S. Bib #12: Jimmy Lanier (Veteran) Junior in H.S. The trail will begin three miles from Cantwell. The young mushers will start in 2-minute increments. 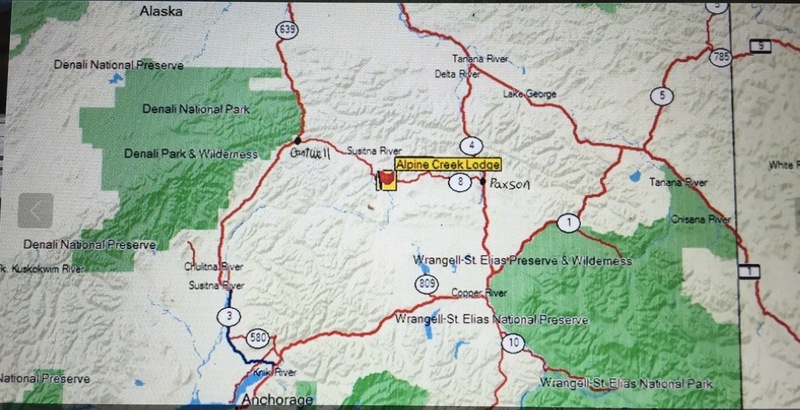 They will mush 65 miles until they reach the Alpine Creek Lodge. Here they will take their mandatory 10-hour layover. When they arrive the mushers will lay straw down for their dogs, take their booties off, feed their dogs, and any other necessary chores. The junior mushers have a tradition of sitting around a campfire getting to know each other during the 10-hour layover. 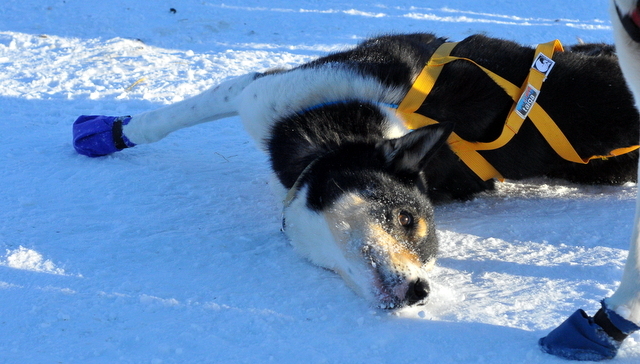 Mushers will make up the 2-minute time differential when they depart the lodge and head back. Jimmy, bib #12, will be able to leave exactly 10 hours after he arrives. Jannelle, bib #11, will leave 10 hours and 2 minutes after she arrives at the lodge, and so on. The champion of the Junior Iditarod will be the lead musher in the Iditarod Ceremonial Start on Saturday, March 7, in Anchorage. 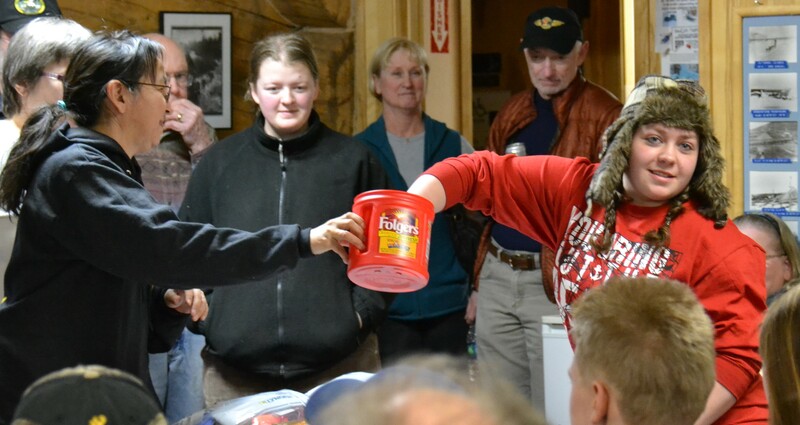 The winner will also be flown to Nome to attend the Iditarod Finisher’s Banquet. Congratulations to Conway Seavey, the winner of the 2014 Junior Iditarod! Here he is leaving from the starting line on Saturday morning. The 2014 Junior Iditarod officially concluded tonight with the Junior Iditarod Awards Banquet. The juniors graciously accepted their awards and prizes and thanked their families and sponsors. The prize committee worked exceptionally hard this year and the kids earned a variety of scholarships and awards totaling in the neighborhood of $17,000. I always tell my students that one of the things that intrigues me so much about the Iditarod is that the mushers are great role models and often exemplify character traits that we value. The Junior Iditarod mushers are no exception to this rule. There are even special awards given to the mushers who demonstrate exceptional character. Each year one junior musher is recognized with the Sportsmanship Award. This year the award was given to Kevin Harper. After leaving the halfway point, Jimmy Lanier ran into a bit of trouble. Apparently a few of his dogs got a little “chew-happy” and chewed through the lines that attached the leaders to the rest of the team and the leaders were able to get away from the team. Kevin, without hesitation, stepped up to help Jimmy out. He chased down the leaders, turned his team around and brought them back to Jimmy, and then had to turn his team around again to head off back down the trail. The veterinarians award one junior musher the Humanitarian Award each year. This award is given to the person who is judged by the vets to have taken the best care of their dogs during the race. In presenting the award this year the vets, Dr. Meyer and Dr. Hempsted, said that the award could have been given to many of the mushers, but they ultimately decided that Ben Harper was the most deserving candidate. When we learn about the Iditarod at school we often discuss the idea that most of the mushers are not in the race to win it. They run the Iditarod to challenge themselves and to have a grand adventure. We talk about the trait of perseverance and the idea that setting goals and not quitting until you succeed are life lessons we can learn from the mushers. This is also true for the Junior Iditarod mushers! Each year the Red Lantern award is given to the musher who sticks with it and gets themselves to the finish line, even when they are last, without quitting. 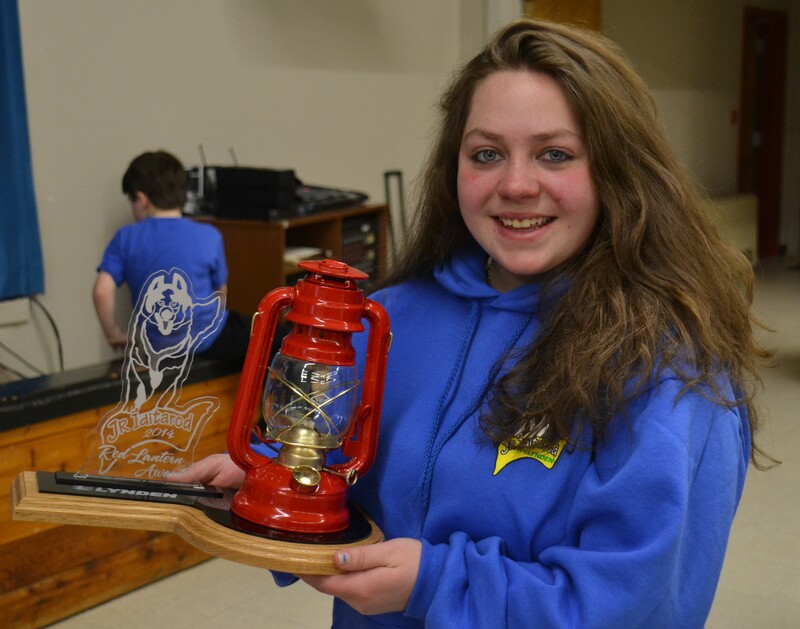 This year the Red Lantern winner was Nicole Forto. 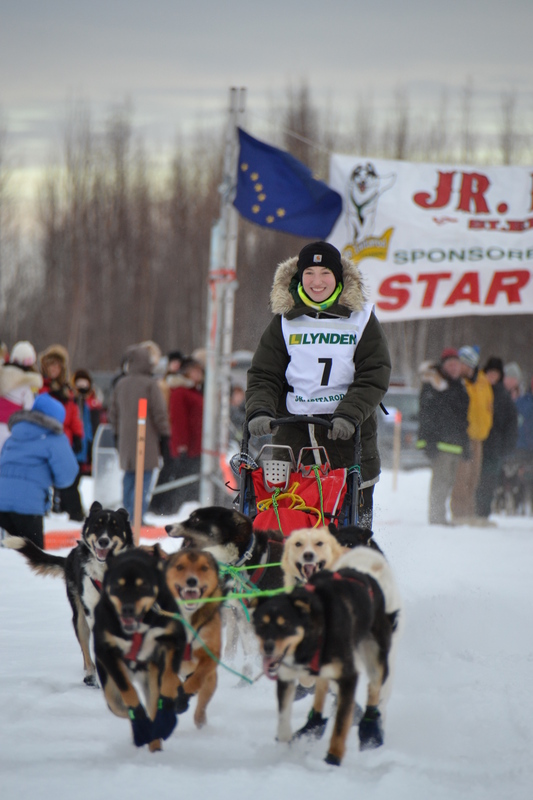 Nicole showed great strength and perseverance and completed her rookie Junior Iditarod! The Junior Iditarod is an amazing event and I am grateful for the opportunity to be so involved with it this year! Everyone was so inviting and welcoming and so obviously loved what they were doing. A special thanks to Lacey Hart and Nicole Forto for all of the time, talent, and energy they gave to my students this year. The boys loved working with you almost as much as I did! Congratulations to all of the junior mushers and the entire Junior Iditarod family for a job well done! Thanks for including me in your fun! The Juniors are Off and Running! We arrived at Martin Buser’s Happy Trails Kennel about 8am this morning and the action was already in full swing! The kids were busily unloading the dogs, taking care of their feet, having their sled bags checked, getting their SPOT trackers pinned to their sleds, and getting their last minute advice and hugs and kisses. I got the chance to check in with Nicole Forto and her dad Robert. Nicole is the Junior Rookie Musher my class has been following all year. She seemed calm, cool, and collected. She says is ready to go and really excited about her adventure. Her dad says he’s confident that she is ready to face this challenge. They let me get a good look at the two trackers. They were given the trackers in dog booties and had them pinned to the top of the sled bags with huge safety pins. One is pinned down near the brush bow and the second is up higher near the handlebar. The tracker near the handle bar has a panic switch. So if the kids feel like then are in trouble they can push it and someone will come out and check on them. To push the switch, you have to lift a tab, so it can’t accidentally be pushed. Lacey Hart, Race Marshall, says that this part of the race, the start, was the hardest part. She says the rest of the race for her will be a lot of thinking and checking on things, but that this was the most active and stressful part! She’ll be flying out to Yentna Station soon. Because the front runners are expected to finish tomorrow before sunrise, she’ll be riding a snow machine back with the trail breakers so that she’ll make it to the finish line before the first mushers. She’s anxious to see the kids come in to Yentna this evening. The start went off without a hitch! The setting was beautiful, the dogs were beautiful and the kids were all smiling! The Juniors Have a Starting Order! What do GPS Trackers, trail markers, pizza, trail stakes, dog tags, race bibs, pictures, and dog booties have in common? They all had featured roles in tonight’s Junior Iditarod meeting. After sharing some pizza, signing some autographs, and having some pictures taken, the juniors got started on their final meeting before hitting the trail tomorrow morning. As I’ve gone into schools to share this week, one of the things I’ve been talking to the kids about is the setting of the Iditarod and wondering with such a long race, how on earth do the mushers know where they are? The kids have come up with lots of ideas – they can tell by the landmarks, the checkpoints, the dogs know – but tonight the junior mushers and I got to hear all about how the trail is marked for the Junior Iditarod from the Trail Boss. The trail is marked with stakes that have bright orange paint at the top and are labeled with JRI for Junior Iditarod. The trail markers may be a half mile to a mile apart, but they are within sight of each other. The kids were told if they can’t see the next trail marker, they may want to stop and think about where they are! If they see two markers together on one side of the trail, they know that they need to turn in direction. They only have wide sweeping turns, no right angle turns on this trail. If they see two stakes crossed like an “x” that means “don’t go this way!” The coolest thing about the trail markers? Each junior was given one to keep as a souvenir! Their special stakes even have the Junior Iditarod logo on them. Since they got their own to keep, the kids were encouraged NOT to take them from the trail! The trail this year will be slightly shorter than normal due to the change in starting location. The juniors will travel 62 miles out, take their ten hour layover at Yentna Station, and then travel 62 miles back in. The kids were glad to hear that the trail still covers part of the Iditarod Trail, so they can officially tell people they have “raced the Iditarod Trail.” The Trail Boss described the trail as fast, but luckily it is all frozen, so there is on open water at all. Probably the most exciting thing for the kids was the start order draw. The kids were called to the front in the order they signed up for the race, so our friend Nicole Forto got to draw first. She drew number six. No one drew number one, as that space is saved for an honorary musher. 2 – Jimmy Lanier – Jimmy is sixteen years old and a junior at Chugiak High School. His dad, Jim, has run the Iditarod fifteen times! This is his second Junior Iditarod. He also plays baseball. 3 – Josh Klejka – Josh is seventeen years old and is a junior at the high school in Bethel. 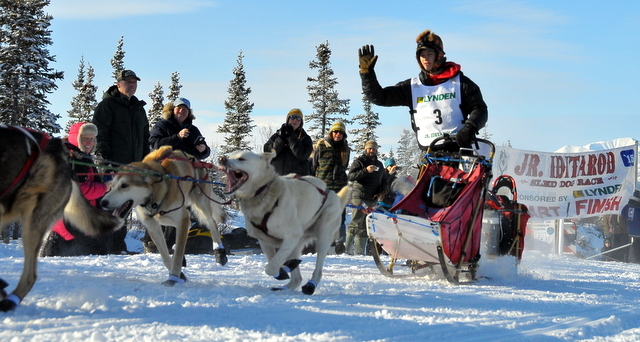 He finished eighth in the Junior Iditarod in 2012. He also runs cross country. 4 – Conway Seavey – Conway is seventeen and is an eleventh grade homeschool student. He has finished the Junior Iditarod three times and won in 2012. He is also a very talented singer and songwriter. 5 – Andew Nolan – Andrew is fourteen years old and is a ninth grade homeschooler. He’s been training for the past two years with an Iditarod veteran. 6 – Nicole Forto – Nicole is sixteen years old and is a junior at Houston High School in Willow, Alaska. In addition to mushing, she owns Wickes Sweets Baking Company. 7 – Janelle Trowbridge – Janelle is sixteen years old and was born in Michigan. She and her family moved to Nome, Alaska in 2009. She is a junior at Nome Beltz High School. She also runs and skis for her school’s biathlon team. 8 – Kevin Harper – Kevin is fifteen and is a sophomore at Wasilla High School. This will be his first race! In addition to mushing he wrestles. 9 – Ashley Guernsey – Ashley is a fourteen year old eighth grader at Seward Middle School in Moose Pass, Alaska. In addition to mushing she runs cross country and track. 10 – Ben Harper – Ben is seventeen and is a senior at Wasilla High School. This will be his third time running the Junior Iditarod. Tomorrow is the big day! The mushers have to be at Happy Trails Kennels by 9am and the race officially gets underway at ten am. 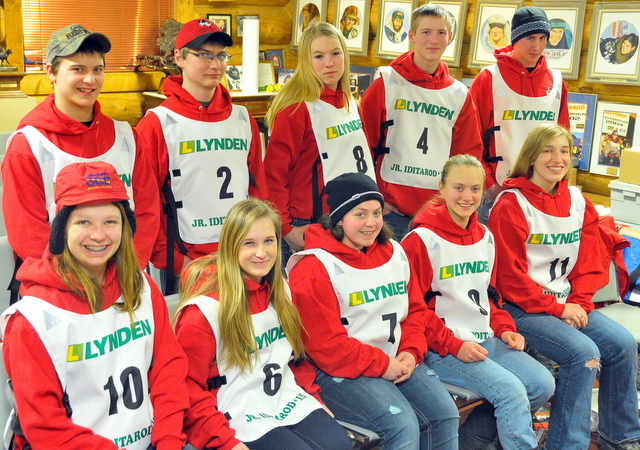 Best of luck to all of this year’s Junior Iditarod Mushers! See you on the trail!